Just some of the machines and systems whose restoration or building has been undertaken under the auspices of the Computer Conservation Society. From time to time the Society is approached by people who have come into the possession of documents relevant to historic computers and who feel that they should “go to a good home”. Unfortunately the Computer Conservation Society is no longer in a position to collect such material, though we can sometimes suggest a suitable home for it. If you have a need to dispose of historic material we suggest that you should first read our guide Archives and your Personal Papers. In particular, we should stress that a list of the document titles is essential before any progress can be made. Because CCS members use widely differing IT systems, difficulties sometimes arise when documents are sent between members. In an attempt to minimise such problems a page of guidance notes can be found at document_exchange.htm. The web page also contains useful information for authors of articles in the CCS journal Resurrection. A party of CCS members (and partners) Ttravelled to Namur in Belgium to visit the excellent computer museum there. Although the museum is tucked away in the outskirts of the city and looks somewhat unprepossessing from the outside, once inside it is a really well-presented collection of artefacts which have been put together from four previous collections in the country. 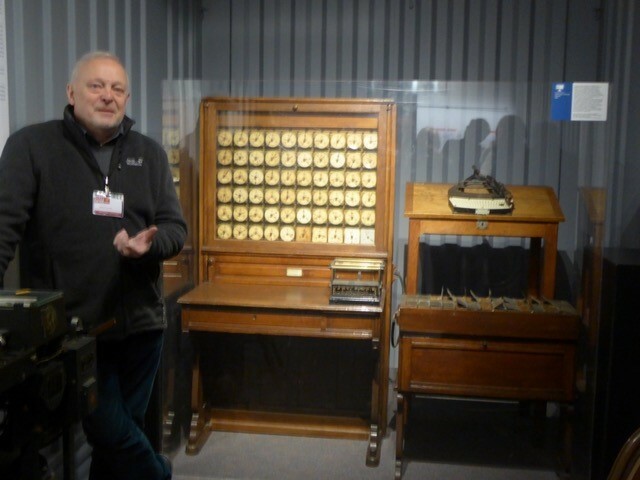 The undoubted star exhibit is an 1882 original Hollerith machine which counts holes in punched cards and displays the results on a set of dials above. Brought to Belgium by IBM for he 1958 World’s Fair (EXPO 58) it was unaccountably left behind and is now a designated national treasure being one of only four such machines remaining. Our photograph above shows it with one of our hosts Ward Desmet, President of the NAM-IP Association. Our hosts were generous with their time and hospitality, a process much assisted by Belgium’s well-deserved reputation for excellence in both cuisine and beer a great deal of which was consumed with enthusiasm (you would expect no less). Our heartfelt thanks to our hosts Ward Desmet and Ferdinand Poswick. Founded in 1989, the Computer Conservation Society is a joint venture between the British Computer Society, the Science Museum and the Museum of Science and Industry in Manchester. Our primary mission is to preserve historic computers, develop awareness of the history of computing, and encourage research. We run many specialised projects, organise public lecture series, and publish a regular bulletin. If you would like to join the society, please click here for more information.